Rugged, remote, and little-visited, Western Mongolia can be challenging to travel in; but for those who make the effort it's an unforgettable experience. Altai Tavan Bogd National Park is the highlight of West Mongolia. This scenic park in Bayan Olgii's border region is the best place to see the Altai Mountains and offers opportunities for hiking, horse riding, fishing, and rafting. My page has maps, pictures, and detailed advice on the park's attractions. 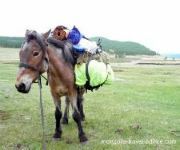 Click here to see my Tavan Bogd National Park page. 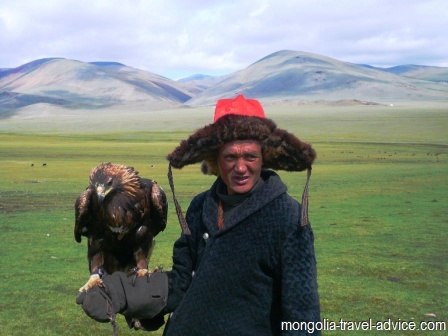 Eagle hunting (falconry) is an iconic sport of Central Asia and West Mongolia, its traditions having survived better under communism than the 'Stan countries, is the best place to witness it. Find out all about how the locals catch, keep, and hunt with their birds, and how you can witness it yourself. Also be sure not to miss the truth about the Eagle Festival. Click to go to my eagle hunting page. Kazakh Culture has its home in Bayan Olgii, Mongolia's Westernmost and arguably its most beautiful province. Kazakh culture has been uniquely preserved in Bayan Olgii, to the point where it is now more 'Kazakh' than Kazakhstan. Learn all about this at my Kazakhs in Western Mongolia page. Olgii, the capital of Bayan Olgii aimag, is the best city in Western Mongolia to organize a tour. For an overview, maps, photos, and details on hotels, restaurants and tour guides in Olgii, go to my Olgii travel guide page. Many travelers will also visit Khovd, capital of Khovd aimag. The place is a decent place to stock up on supplies or relax for a day or two, but is otherwise pretty quiet. Go to my Khovd page. 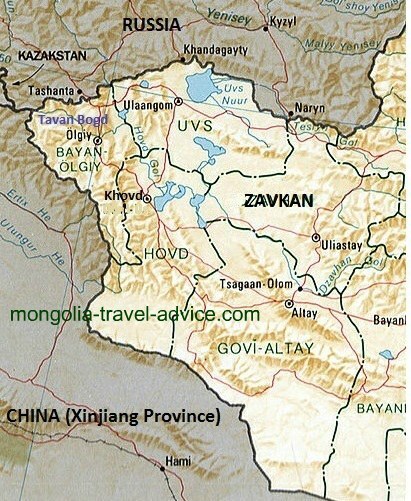 Go to my page on Zavkhan and Uvs aimags for pictures and highlights of these little-visited regions which are covered in scenic back-roads and beautiful snow-capped mountains rising from the semi-desert. 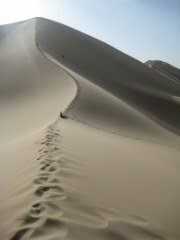 The page includes a few very off-the-beaten track mountainous areas to go hiking or horse riding. The Lonely Planet lists the lakes in the great lakes depression, Uvs Nuur, Khar-Us Nuur, and Khar Nuur, as highlights of Western Mongolia. I have no idea why: the shorelines of these places are barren, windswept, and devoid of anything interesting. Birdwatchers might be attracted to the reedy river inlets, but for most travelers there is no particular reason to go out of your way to see these places.